Very good news on Wednesday when Barclays Bank agreed to give Dahabshiil, the Somali remittance company, sufficient time to find another way of transferring money from the UK and elsewhere to Somalia before closing its account with them. Up to $2 billion a year is sent from Somali exiles to their families back home, mainly through Dahabshiil. With much of the country destroyed by war, this inflow keeps millions of Somalis and their families alive, drives what business there is and enables more Somalis to stay and rebuild the country rather than seek exile. 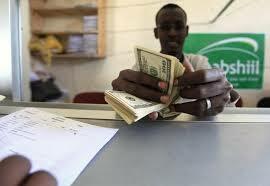 Under international money transfer rules, Dahabshiil can collect money from Somali families in the rest of the world and dispense it from shops in Somalia, but only a bank can transfer it across borders. That is what Barclays have been doing for 15 years. In October last year however the bank decided to stop handling Dahabshiil money on the grounds that there was too much risk of money laundering and terrorism. The US government and other countries have cracked down on this in recent years. Dahabshiil can account for every penny sent and collected but admit that of course it cannot account for how it is spent, although all large amounts are double checked and anything suspicious is reported. When Barclays made the announcement, Dahabshiil went to court to seek an injunction against the bank and got a stay of execution. Now Barclays has said they are prepared to wait until Dahabshiil has found an alternative. That is extremely important for Somalia. Somalis are brave travellers and one of the most entrepreneurial peoples in the world. In 2006 during the brief period when peace broke out Mogadishu, the capital, was transformed with people moving around, exiles returning, goods shifting and businesses beginning to flourish. The population started wearing watches and jewellery in the street; simple everyday actions they had been unable to perform for almost 15 years. But the violence returned and since then, despite Somalia now having an internationally recognised government, the pendulum has swung back to more repression and terrorism. Al Shabaab remains a threat and pro-islamist funding from Saudi Arabia has poured into Somalia. Without remittances that money would have become even more powerful. But even before Shabaab started, when the whole of Somalia was engulfed in clan warfare, the remittance system worked well. Of course – as with anywhere else in the world – there were armed guards for the carriers, but the remittance transporters and shops had a certain immunity. I have a memory of Bosaso a decade ago outside a remittance shop: a pick-up with a heavy calibre machine gun on the back, known in Somalia as a technical, three gunmen with AKs and a man carrying half a dozen mail bags of cash into the small but fortified shop. Since then the temptation to steal the remittances of thousands of ordinary people has been resisted by even the most cynical gunmen. If Dahabshiil had been prevented from making the transfers, Western countries would be paying hundreds of millions more for emergency food aid and there would still be pictures of starving Somalis beamed around the world. As it is, schools are open in some areas, teachers getting paid, businesses operating and the economy ticking over. By coincidence the Overseas Development Institute (ODI) has launched a report on the importance of remittances generally in Africa and revealed that it costs almost twice as much to send money to Africa than anywhere else in the world. ODI reckons just over £1 billion is lost to Africa because of overcharging transfer fees. It blames weak competition, concentration of market power and flawed financial regulation for these high charges and suggests that the two market leaders – Western Union and MoneyGram – account for two-thirds of remittance transfers giving them some $586 million as a remittance ‘super tax’, part of it through “opaque foreign currency charges”. This seems particularly weird when you think that Kenya, a neighbour of Somalia, has the world’s most highly developed mobile phone banking system and the technical cost of transfers is negligible. Is it just because it is Africa? I made a quick check on Western Union’s prices this week. This revealed that to send £200 online to Thailand costs £12.50, to China £6.90, £4.90 to Venezuela and £9.90 to send to the same amount to Uganda (Dahabshiil charges £12, but £10 to Somalia) and most other African countries (as well as the United States). Enforcing international laws against price fixing internationally is not easy. Last week I heard from someone in Uganda who found that £60 in a savings account in an international bank had disappeared over two years. Why? Bank charges, online charges etc, it was explained. But the customer had not touched the money in that time or used the online service. My understanding is that a savings account means you are lending the bank money and most savings accounts pay an interest rate. Not in Uganda apparently. There the basic rules of capitalism are reversed by the bank. They charge you for borrowing and investing your money. Sounds like theft to me. A few years ago I found myself in casual conversation with the chairman of a very big bank that had decided to open in South Africa. That’s good I told him, bank charges and interest rates in South Africa – and even more in the rest of Africa – are at ridiculous levels. Who can afford a loan or a mortgage in most African countries? A new competitor would bring down the price of banking, I suggested enthusiastically. “And why would we want to do that?” he said with a smile and a steady eye. Because – I might have answered – a lower cost of banking and money transfers would encourage more people to bank their salaries and remittances. You would win in the long term. The present cost is ridiculous. But I kept quiet. The ODI blames ‘exclusivity agreements’ between the money transfer companies, their agents and banks that restrict competition and drive up prices. African financial regulations also favour banks over other remittance payment options, but ODI argues they should do more to secure a better remittance deal for their citizens. It also encourages governments and their regulatory authorities in sending countries to do more to promote competition and encourage innovation.